1. Understanding Geographic Space (W.A. Mackaness). 2. Conceptual Models of Generalisation and Multiple Representation (L.T. Sarjakoski). 3. A Synoptic View of Generalisation Operators (N. Regnauld, R.B. McMaster). 4. Modelling the Overall Process of Generalisation (L. Harrie, R.Weibel). 5. Evaluation in the Map Generalisation Process (W.A. Mackaness, A. Ruas). 6. Databases Requirements for Generalisation and Multiple Representations (S. Mustière, J. van Smaalen). 7. A Real-Time Generalisation and Map Adaptation Approach for Location-Based Services (T. Sarjokoski , L.T. Sarjokoski). 8. Experiments in building an open generalisation system (A. Edwardes, D. Burghardt, M. Neun). 9. A data warehouse strategy for on-demand multiscale mapping (E. Bernier, Y. Bédard). 10. Relevance of Generalisation to the Extraction and Communication of Wayfinding Information(M. Sester, B. Elias). 11. 3D Building Generalisation (L. Meng, A. Forberg). 12. Characterising space via pattern recognition techniques: Identifying patterns in road networks(F. Heinzle, K-H. Anders). 13. Generalisation of Geographical Networks (R. Thomson, R. Brooks). 14. A Prototype of Generalisation based on the Multi-Agent System Paradigm (A. Ruas, C. Duchêne). 15. Managing Generalisation Updates in IGN Map Production (F. Lecordix, C. Lemarié). 16. Automated generalisation in a map production environment – the KMS Experience (P. West-Nielsen, M. Meyer). 17. Observations and Research Challenges in Map Generalisation and Multiple Representation (W.A. Mackaness, A. Ruas, L.T. Sarjakoski). Users have come to expect instant access to up-to-date geographical information, with global coverage--presented at widely varying levels of detail, as digital and paper products; customisable data that can readily combined with other geographic information. These requirements present an immense challenge to those supporting the delivery of such services (National Mapping Agencies (NMA), Government Departments, and private business. 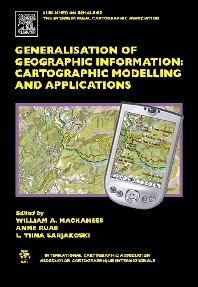 Generalisation of Geographic Information: Cartographic Modelling and Applications provides detailed review of state of the art technologies associated with these challenges, including the most recent developments in cartometric analysis techniques able to support high levels of automation among multi scale derivation techniques. The book illustrates the application of these ideas within existing and emerging technologies. In addition to providing a comprehensive theoretical underpinning, the book demonstrates how theoretical developments have translated into commercial systems deployed within NMAs. The book explores relevance of open systems in support of collaborative research and open source web based map services. University of Edinburgh, Scotland, U.K.